Pastry cream, also called Creme Patissiere, is a rich, thick and creamy custard made from a mixture of milk, eggs, sugar, flour and cornstarch (corn flour). Vanilla, liqueurs, chocolate, coffee and fruit purees are some complementary flavorings that can be added to the cream. If a lighter pastry cream is desired, a little whipped cream can be folded into the pastry cream once it has thickened and cooled. Pastry cream is classified as a filling. It has a smooth and creamy texture that is a staple in pastry kitchens. It is used to fill all sorts of cakes, tarts, cream puffs, eclairs, Napoleons, and other pastries. A pastry cream is similar to a custard in that it is cooked on the stove and must be stirred constantly to ensure that it does not curdle, resulting in small pieces of cooked egg in the cream. Once made, it is best to immediately cover the surface of the cream with plastic wrap as this will prevent a skin from forming on the top of the cream. If not using right away refrigerate until needed, up to 3 days. Before using, bring to room temperature and stir or whisk to get rid of any lumps that may have formed. Vanilla seems to be the most popular flavoring for Pastry Cream. Traditionally a vanilla bean is added to the milk and once heated, the vanilla seeds are removed from the pod and added to the hot milk. Not one to waste, I then like to wash and dry the vanilla pod and add it to my canister of white sugar. Open the sugar canister after a few days and the room will fill with the lovely sweet scent of vanilla. Use the vanilla scented sugar in your baking or I even like it in my hot chocolate or to sweeten a bowl of fresh fruit. Vanilla beans are usually packaged in small plastic cylinders and are sold in specialty grocery stores and health food stores. Buy vanilla beans that are shiny and black, tender, plump and moist, preferably with the white powder of vanillin on them. Never buy hard, dry and shriveled beans because they are past their prime. I know that vanilla pods can be expensive and also hard to find, so either pure vanilla extract or pure vanilla bean paste can be used instead. Try to use "pure" vanilla extract, not the imitation vanilla extracts which are made with synthetic vanilla (from glycoside found in the sapwood of certain conifers or from coal extracts) and leave a bitter after taste. Products labeled Vanilla Flavoring are a combination of pure vanilla extract and imitation vanilla extract. There is also a relatively new product called Vanilla Bean Paste that combines tiny vanilla seeds with pure vanilla extract. I love this product as you get the convenience of vanilla extract yet with all those lovely tiny black vanilla seeds from a vanilla pod. Plus it is much cheaper than vanilla pods. Nielsen-Massey makes Vanilla Bean Paste and it can be found in specialty food stores or on-line. 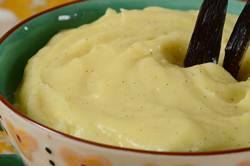 Pastry Cream: In a medium-sized heatproof bowl, mix the sugar and egg yolks together. (Don't let the mixture sit too long or you will get pieces of egg forming.) Sift the flour and cornstarch (corn flour) together and then add to the egg mixture, mixing until you get a smooth paste. Meanwhile, in a saucepan bring the milk and vanilla bean just to boiling (just until milk starts to foam up.) Remove from heat and add slowly to egg mixture, whisking constantly to prevent curdling. (If you get a few pieces of egg (curdling) in the mixture, pour through a strainer.) Remove vanilla bean, scrape out seeds, and add the seeds to the egg mixture. (The vanilla bean can be washed and dried and placed in your sugar bowl to give the sugar a vanilla flavor.) Then pour the egg mixture into a medium saucepan and cook over medium heat until boiling, whisking constantly. When it boils, whisk mixture constantly for another 30 - 60 seconds until it becomes thick. Remove from heat and immediately whisk in the liqueur (if using). (Stir in vanilla extract if using instead of a vanilla bean.) Pour into a clean bowl and immediately cover the surface with plastic wrap to prevent a crust from forming. Cool to room temperature. If not using right away refrigerate until needed, up to 3 days. Whisk or stir before using to get rid of any lumps that may have formed. Makes about 1 cup (240 ml). Preparation time 20 minutes. For lighter pastry cream fold in 1/2 cup (120 ml) softly whipped cream to cooled pastry cream. For Chocolate pastry cream add 2 ounces (60 grams) of finely grated bittersweet or semi-sweet chocolate to the hot pastry cream. Stir until melted. For Coffee pastry cream add 1/2 - 1 tablespoon instant espresso or coffee powder to the hot milk. For Raspberry pastry cream add 1/4 cup (60 ml) (or to taste) raspberry sauce to pastry cream.